“The sun wasn’t up, and yet my husband, Tyler, and I were waking up from a restless night’s sleep to the day that would change our lives forever. There was no possible way to describe the feelings—we were overwhelmed, anxious and excited for what was to come that day. We loaded into the car, coffee in hand, for what would be our last car ride as a family of two. We anxiously arrived at the hospital at 6:15 AM and took a look around as we were carefully instructed by the agency to please arrive 15 minutes after the birth mom had arrived. The weight of the situation started to hit—knowing that our daughter’s birth mom was there too, getting checked in to deliver our baby. We headed inside the large lobby only to find there wasn’t a single soul working at that hour. On the labor and delivery floor, we were greeted by our sweet photographer we had hired for the day with the hopes we might somehow be able to capture all of the feelings to treasure forever. Once more, the hospital was barely staffed at this point and we took our seats in the cozy waiting room. Shortly thereafter our families arrived and there wasn’t an empty seat in the waiting room. We had arrived for what we thought was a scheduled c-section since our little girl had been breech the previous week. The agency instructed us at about 7:30 AM all was going according to plan and that we should be meeting our daughter for the very first time in one short hour after the c-section. I could barely process the information, which was just as well because 15 minutes later the agency let us know the baby had turned and the birth mom would be induced. We knew then that we were likely in for a long day in that little waiting room. We patiently waited all morning and passed the time by chatting, having my dad make multiple Starbucks runs, and being entertained by our precious niece and nephew. Lunchtime came and went and we still had very few updates. Tyler and I were not about to leave the hospital in case something were to happen quickly, but I definitely started to feel anxious. After what seemed like an eternity of waiting, we were finally told at 4:30 PM that there were some signs of progress. At this point, I had almost grown comfortable and accustomed to the waiting and now the nerves really started to set in. Suddenly at 4:50 PM, the doors to the waiting room swung open and we were told, “I have some news! We have a room for you and need you to come now.” Our world stood still for a moment and we didn’t know exactly what to do with ourselves, but we hurriedly grabbed what things we could find and rushed back to the room right next to the delivery room where our daughter would enter the world. There is no way to mentally prepare for such a moment. We had just put our things down in the room when I completely lost it. The weight of the 2+ years of infertility and waiting, the self-induced pressure of having to be strong and keep it together all that time, the dreams I thought I would never actually realize finally coming true. A moment later, we heard a door open and our door open and in walked the nurse rolling a cart in with OUR BABY. POWERFUL, powerful was that moment. I had been sitting on the hospital bed as I was told we would do skin-to-skin time right away, and felt paralyzed there for the moment. The agency instructed us that we could walk over while the nurse did the initial checks. We did, and then we saw HER. No words. I simply had to stare in complete disbelief and wonder. She was here and she was ours. I quickly rushed back to the bed to get ready for skin-to-skin and the nurse brought her over and put her down on my chest. That was the moment I became a mom, the moment my tiny 6lb 1oz little girl came crashing into our world. I was so overcome with emotions. I had dreamt of this moment for so long, and yet I’m not sure I had ever pictured it being quite so beautiful. God had orchestrated our family in a way I had never been able to imagine before. The beauty and the power of that moment felt like His way of saying ‘thank you for being patient, for ultimately trusting My plan’. 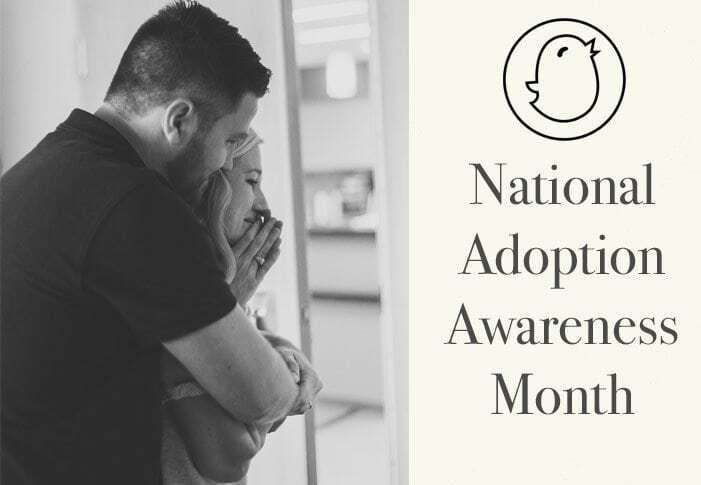 We had stretched and opened our hearts wider than we thought possible, opening ourselves to the possibility of growing our family through adoption, and in an instant, she filled every ounce of space in our hearts. After a few minutes of holding her and cherishing our first moments together as a family, we invited our families in and once again the tears flowed. Years of support and of shoulders to lean on came through that door to celebrate our new family. Then it was Tyler’s turn for skin-to-skin, and watching my husband melt over our tiny little girl was simply magical. Years of being so strong for us, and years of wanting this so deeply shown on his face. He was so in love and it was beautiful to witness. That evening as our families left and as we shared quiet moments together as a new family, I was so overcome with deep gratitude. I knew the gift of motherhood was the greatest gift I had ever been given, in the form of our perfect little angel. I knew I would never forget the blessing. In the early hours of the following morning, I would simply stare at her, still in disbelief and with overwhelming feelings of deep love. The lullaby station played “It Is Well with My Soul” and through my tears I thought there couldn’t be a more perfect description. The deepest parts of my soul were WELL. Not just well enough to make it through to next month, not well enough to sport a forced smile, but truly and deeply WELL. Tyler and I were discussing our journey through infertility, heartache and never being able to clearly picture how the family we wanted so desperately would form. We talked about the magical gift we had been given, and I will never forget when he said “she is enough, she will always be enough.” And it was true. We had enjoyed many precious moments as a little family in the hospital, and were approaching the 48-hour mark where the papers would be signed and she would officially be ours. The birthmom had granted our every last wish in becoming parents through adoption and I had such an overwhelming sense of peace that day. The papers were indeed signed and we loaded up into our car, now a family of three. We are so grateful to the birthmom who made the hard choice and gave us this incredible gift. We are thankful for her courage and for making a sacrifice we can’t fathom. She brought the most beautiful life into this world, and gave us the most cherished gift. And we are thankful God brought our lives together in such a profound way. We want to thank Courtney for her incredible contribution to our Adoption Awareness Month celebration! You can follow Courtney’s complete adoption story on her personal blog, Littlest Ray Of Sunshine.